Details about NHL Philadelphia Flyers Hockey 6 Foot Leash 3/4” Wide - NEW! NHL Philadelphia Flyers Hockey 6 Foot Leash 3/4” Wide - NEW! 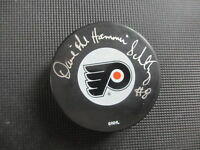 Rod Brindamour Autographed Signed Philadelphia Flyers Puck COA NICE AUTOGRAPH!